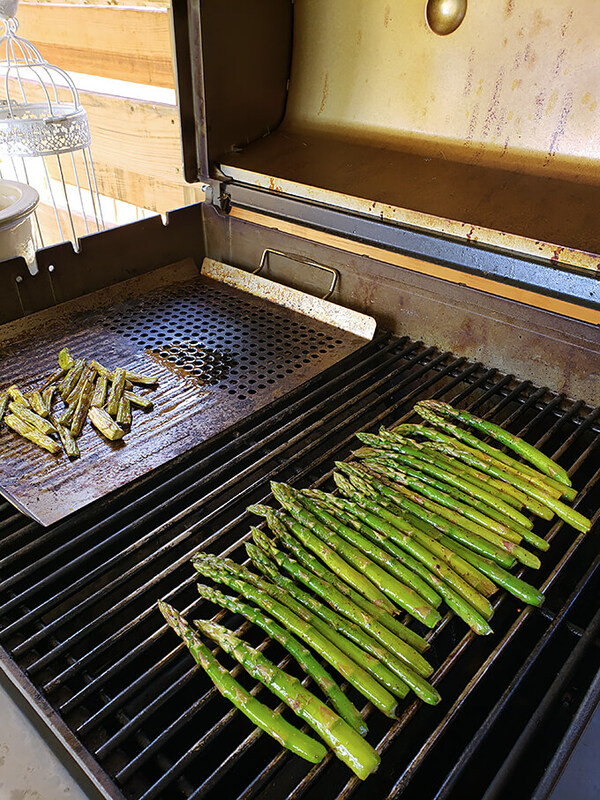 Grilled Asparagus with Garlic and Parmesan is one of the simplest and most fantastic dishes from the grill. It’s as simple as marinating asparagus with some olive oil, balsamic vinegar and garlic and grilling for a few minutes. 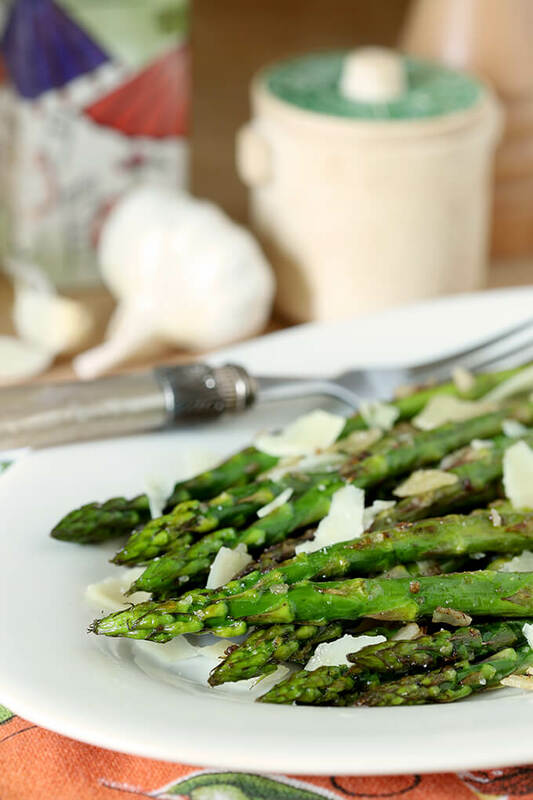 Top with a bit of Parmesan and they are the best asparagus ever! 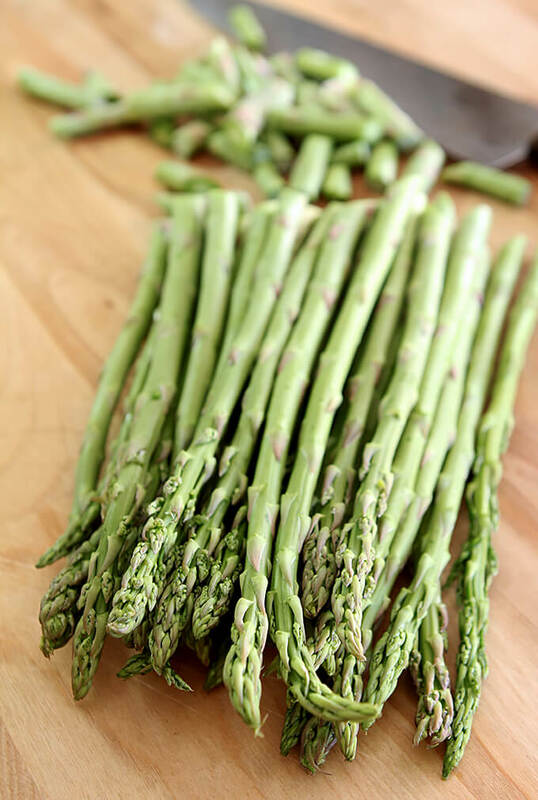 If I did a simple poll I am betting that if asked, ‘Did you like asparagus as a kid?’ that the majority response would be something dramatic like ‘EW!’ or ‘Make Mikey try it!’ – am I right? It was always canned, it was always mush and it was on the list of my worsts that included canned peas, overcooked broccoli, cauliflower, and Brussels sprouts. The first time I decided to give it a try as an adult when it was being heralded as the next new, big, ‘old’ thing and I was certain it would not live up to the hype, not unlike Kale. Except for this kale pesto I have never met a kale leaf I liked. Luckily I was wrong. Since that first time years ago when I tried Grilled Asparagus with Garlic and Parmesan I’ve not looked back and this dish that made it all happen is still my favorite simple preparation. When a friend would ask if the recipe was on my blog I admit I had never considered including it. Some things seem so simple that I feared a revolution if I shared my ‘recipe.’ On top of the revolution would be the accompanying scathing commentary…no wait, I’m lucky, I don’t get scathing commentary and I’m grateful for that…thank YOU! Still, over the course of the last couple of years I have shared this simple preparation with friends so many times that I couldn’t help but finally follow their lead and make it happen. It’s simple but if you haven’t tried it, I still think it is also simply the best. Guess what I did for the first time this summer? I’m not sure why I didn’t grill this past winter but I’m sure excited about having the grill up and running again…I could make almost EVERYTHING on this thing. How about you…are you a grillin’ fool too? Using it for veggies is a favorite and a grill pan like this makes it work for so many…hunting for pieces that fall through the cracks was never fun. 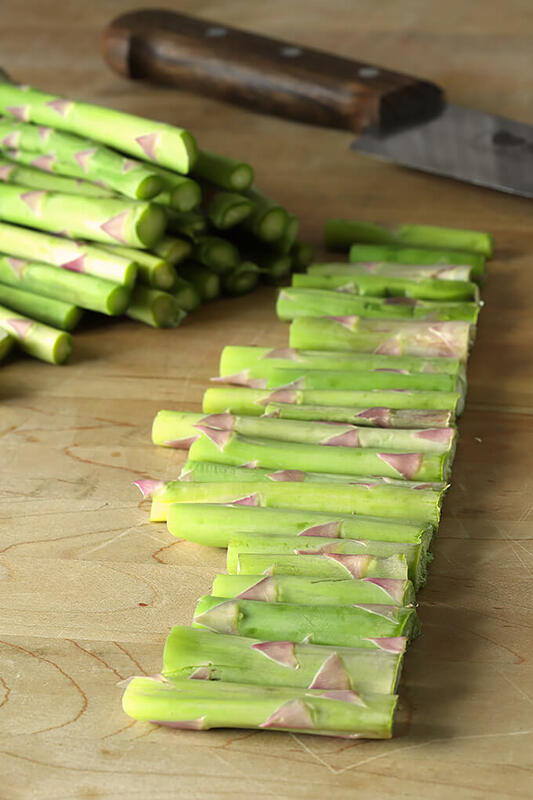 Know the best way to get the most out of your asparagus? Well I’ve discovered a new and fabulous secret! All those ends we so carefully snap off and pitch? Don’t throw them away! I had two pounds of asparagus from Costco that I grilled for a crowd and that big pile of ends just seemed like a lot of waste. 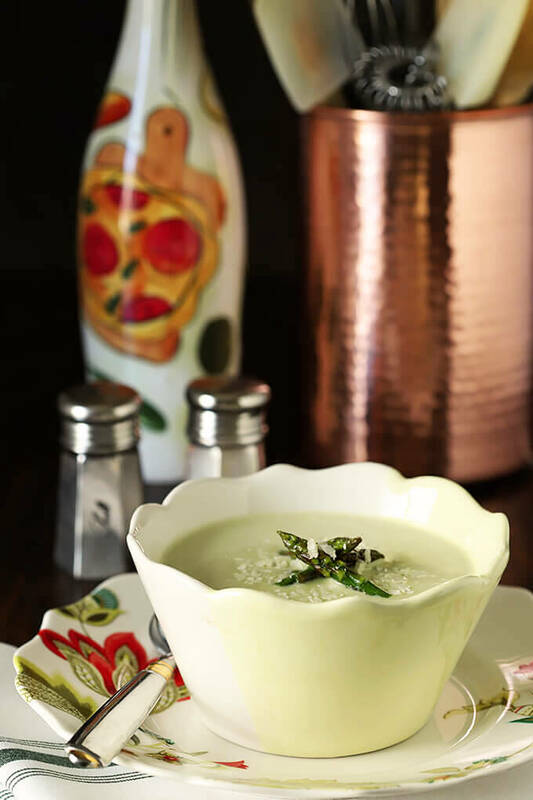 So I turned them into the most amazing Cream of Roasted Asparagus Soup with Garlic and Parmesan Soup. I did not include even one of the tender spears in the preparation because I had so many of the ends but use the whole spears if need be. I used the tips of the tender spears for garnish and it was perfect. It’s so easy and so delicious; I’ve made it twice in the past week! Love asparagus as much as I do? You might also want to try these Bacon Wrapped Asparagus with Garlic and Parsley. Yummy and pretty to boot! Snap ends off of stalk end without tender leaves. Rinse, drain and pat asparagus dry. Put into dish and drizzle oil and balsamic over vegetables, add garlic and salt and pepper. Use your hands to mix up veggies and insure all of the stalks are covered with the marinade and let sit for 15 minutes. Preheat grill on high for 5 minutes and grill stalks for 4-6 minutes; flipping once. I typically use young thin stalks so 4 minutes is plenty but if you get thicker ones, adjust cooking time accordingly. They should be crunchy and bright green; do not cook until they turn a dull green; they're overdone at that point. Put on serving plate and garnish with Parmesan cheese. (I grated some from a block but have used pre-shredded too). Save those tough ends for soup! Lovely! I like that you added some balsamic vinegar also. Thanks Mimi; I love balsamic vinegar and it was perfect with the other components. I’ve never really grilled my asparagus, instead I throw them in the oven. This recipe I’m going to have to try when we bring out the grill this summer, but in the meantime, I will be trying your soup since I also throw those away. You have to try it this way; not only tastes great but that great plus of no real cleanup! Yeah, I was an asparagus hater as a kid. Love it now, though. I usually roast it rather than grill it, but grilling is such a good way to cook it, particularly if you are already using the grill. Wonderful recipe — thanks.